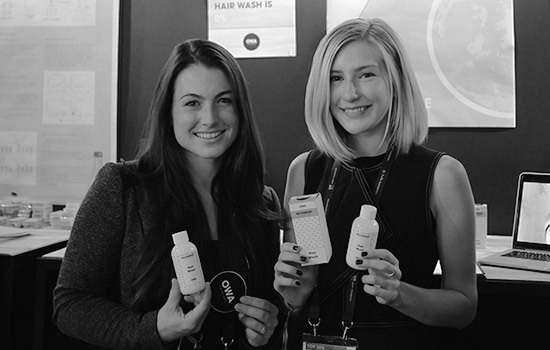 RIT students Lindsay Reardon and Kailey Bradt demonstrate their product, OWA Haircare, at the Hello Tomorrow global summit in Paris. Two Rochester Institute of Technology students have taken their revolutionary hair care product all the way to Europe for the unique opportunity to engage and brainstorm with investors, innovators and industry experts. Kailey Bradt, a student in RIT’s Master of Science in product development program, and Lindsay Reardon, an MBA student in RIT’s Saunders College of Business, are at the Hello Tomorrow Global Summit Oct. 26–27 in Paris. Their student-run company, OWA Haircare, has been named to the Top 500 deep-tech startups worldwide, giving them the chance to receive feedback from industry experts and potential investors assembled from across the globe. According to Bradt, shampoo is comprised of 70 to 80 percent water on average. OWA is zero percent water. According to the Hello Tomorrow website, the organization is “a global organization that annually gathers a community of the world’s brightest talents to propel collaborations between promising disruptive projects and leading entrepreneurs, executives and investors, to bring breakthrough technology to market.” The summit brings together more than 3,000 science influencers and international leaders to explore the latest deep-tech trends and facilitate qualitative connections. Categories include data and artificial intelligence, energy transition, environment, food and agriculture, well-being, healthcare, industry, new materials, mobility and aerospace. Speakers at the summit include global innovators such as Laura Kerber, research scientist at NASA Jet Propulsion Laboratory; Laurent Alexandre, president of DNAVision; Cody Friesen, CEO of Zero Mass Water; Josh Switkes, founder of Peleton Technologies; Ulrich Betz, vice president of innovation biopharma for Merck; NASA astronaut Yvonne Cagle; and Gerd Manz, vice president of technology innovation for Adidas, among others. Earlier this year, OWA Haircare won first place and $10,000 in the “products” category at the eighth annual New York State Business Plan Competition, sponsored by SUNY Polytechnic Institute and the University at Albany. Dana Wolcott, lead innovation coach at RIT’s Albert J. Simone Center for Student Innovation and Entrepreneurship, has continued to work with Bradt throughout the business development process. Follow OWA Haircare on Facebook, Instagram, Twitter, or LinkedIn at owahaircare. Followers can also sign up for the company’s newsletter at owahaircare.com for details on their first collection, Moondust.